Cosmetic Bioglitter® PURE is the world’s first glitter which is 100% plastic free, certified biodegradable in our countryside and verified Microplastic Free. Based on natural materials, Bioglitter® PURE decomposes like a leaf in the natural environment to leave no trace. OK Biodegradable WATER Certification guarantees biodegradation in a natural, freshwater environment. Cosmetic Bioglitter® PURE not only sets a new environmental standard for the glitter industry; with being soft to the touch it’s more comfortable on the skin and being aluminium free it offers a completely new look, that we like to call a “Soft Focus Iridescent” effect. Recently winning the ‘Green and Sustainability’ category in PCHI Fountain Awards China 2019 and Gold for innovation at in-cosmetics global 2018, the world’s most prestigious cosmetic raw material exhibition Cosmetic Bioglitter® PURE is a true revolution for the glitter industry, the first ‘Guilt Free Glitter’. Although designed for use in cosmetics, it’s robust enough to use in household, coating, printing and decorative applications. We are proud to say we have created the most eco-friendly glitter in the world. The original game changer, Bioglitter® SPARKLE, is the first product we developed and is the brightest glitter in the Bioglitter® family. Indistinguishable from traditional plastic glitter, Bioglitter® SPARKLE, like Cosmetic Bioglitter® PURE, is based on plant material rather than plastic and it will naturally degrade in the environment. Containing only a small amount of plastic and with its PROVEN high biodegradation performance in freshwater, only 3% off meeting the performance criteria for OK Biodegradable WATER certification, apart from Cosmetic Bioglitter® PURE, it is still the most eco-friendly glitter on the market. 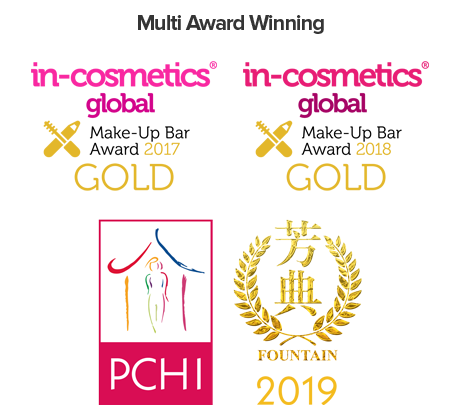 Bioglitter® SPARKLE is also multi award-winning; winner of the ‘Green and Sustainability’ category in PCHI Fountain Awards China 2019 and Gold for innovation at in-cosmetics global 2017, the year prior to Cosmetic Bioglitter® PURE. No other company has won gold in successive years at in-cosmetics global. Bioglitter® SPARKLE is available in three different grades; Cosmetic - for cosmetics and personal care, Deco - for the coatings and fashion industry and Craft - for children and education. We are now investing in further development to remove the final trace of plastic from Bioglitter® SPARKLE, utilising the new and proven natural coating used in Cosmetic Bioglitter® PURE. Cosmetic Bioglitter® is our COSMETIC compliant range of products. Cosmetic Bioglitter® is suitable for use in cosmetic and personal care applications, including festival, nail & body art. Craft Bioglitter® is our range of glitters specifically formulated for primary education level children’s crafting. Craft Bioglitter® is NOT suitable for use in cosmetics, personal care, festival, nail & body art..
Bioglitter is an eco-friendly alternative to plastic based glitter and has been developed to tackle microplastic pollution created by glitter. The Bioglitter brand is often misunderstood as being just a biodegradable glitter, however, it represents much more than that. Completely unique, Bioglitter®, uses natural and plant-derived, non-plastic material as it’s basis, rather than synthetic plastics or bioplastics. All Bioglitter® have been tested and PROVEN to biodegrade into harmless substances in the natural environment. Our ultimate goal being Certified OK Biodegradable WATER by TÜV, which means guaranteed biodegradation in a natural, freshwater environment. Our latest product range Cosmetic Bioglitter® PURE boasts this accolade, which also verifies it as Microplastic Free (ECHA Microplastic Proposal, Jan 2019). Beta Analytic Certificated 100% Biobased Carbon Content. Bioglitter® replaces the core polyester film used in traditional glitter with a unique and special form of cellulose from hardwoods, primarily eucalyptus sourced from responsibly managed and certified plantations operating to PEFC™ www.pefc.org standards. This core in its own right possesses excellent eco-credentials, in it being biodegradable in all environments; certified industrial and home compostable, approved soil, wastewater, freshwater and marine biodegradable. As we progress along the Bioglitter® journey with our latest product, Cosmetic Bioglitter® PURE, we now use a new environmentally friendly coating based on natural resins to produce a glitter which is plastic-free and independently certified freshwater biodegradable. These are eco-credentials never achieved before in the glitter industry. 1 – Removing the Plastic; So not a microplastic. 2 – Certified biodegradable in the natural environment; So it leaves no mess. Our latest award-winning product, Cosmetic Bioglitter PURE, is our first product range to reach this goal. OK Biodegradable WATER certified, which guarantees biodegradation in a natural, freshwater environment and verifies it as microplastic free. Bioglitter SPARKLE, our first award-winning product, already has 92% of its plastic content removed and is only 3% off reaching biodegradable in freshwater certified status. Nevertheless, we are continuing with its development journey to meeting our goals. Don’t be fooled or ‘greenwashed’ into paying the premium for an ‘environmentally friendly’ glitter, when it could be no better than plastic. Words can be cheap when it comes to making ‘green’ claims. Without qualification of the time, quantity and environment, through testing, the term ‘Biodegradable’ is meaningless. Equally claiming % biodegradability or theoretical biodegradable content without any test data is no better. After all, everything is degradable given enough time! Even plastic-free claims are open to exaggeration or totally false claims, as they rely on honesty and full disclosure. Clarity, openness and trust are the very reasons why we qualify and substantiate our claims through testing. Where possible we go one step further; by gaining certification to confirm the validity of the test results via a third-party expert in the field, such as TÜV. The good news on qualifying plastic claims; ECHA’s new Microplastic Proposal, Jan 2019 provides an objective and measured way, through qualified biodegradability testing, to verify if a product is a microplastic or not! with plastic pollution and glitter has played its own small part. Defined as a microplastic, plastic glitter takes hundreds of years to degrade. Because of its physical size and the diverse number of applications; cosmetics, clothing, cards, crafts, to name a few, compost and recycling bins are NOT where glitter ‘ends up’. Supply chains also need to be taken into consideration. Glitter presents a unique challenge, requiring a TOTALLY DIFFERENT APPROACH to the raw material choices that are suitable for eco-friendly compostable plastic packaging. after bathing or washing clothing, which after water treatment can then end up in our rivers and oceans. This is the most probable route that glitter may find its way into marine habitats. Once in the natural environment, glitter like other microplastics, can cause physical harm to small organisms and end up entering the food chain. Making a glitter that could decompose in industrial and home composting processes is NOT enough. Removing the plastic in all Bioglitter® products is our primary goal. However, we also need to ensure our Bioglitter® products are not just compostable, but, biodegradable outside in the much more challenging natural environment. After all, that’s where the microplastic pollution is! So where ever Bioglitter® ends up it leaves no mess. Bioglitter® is the first of its kind and continues to trail blaze. A robust ecofriendly glitter technology reducing and removing plastic, tested and proven to biodegrade in our countryside and waterways. in comparison to other forms of microplastic marine pollution such as vehicle tyre dust, wash fibres from man-made fabrics and the weathering of exterior coatings to name a few. Needless to say, no matter how big or small the potential issue, it still needs addressing. Hence our passion to drive, develop and continue to offer ground breaking, robust and credible alternatives. Bioglitter® DOES NOT DISSOLVE in water, it needs bacteria and other environmental microorganisms to biodegrade. Once it enters the natural environment, such as a farmer’s field, wastewater or our rivers and lakes, microbes will consume the biodegradable content turning it into carbon dioxide, water and biomass. In a microbe and bacteria free environment Bioglitter® is completely durable. The speed at which Bioglitter biodegrades depends on local environmental factors, such as heat, moisture and concentration of microbes. Initiated by conversations in 2010 with selected forward thinking cosmetic manufacturers, we became increasingly aware of the potential issues with small plastic particles in the environment. As a glitter company, we felt duty bound to offer an eco-friendly alternative. 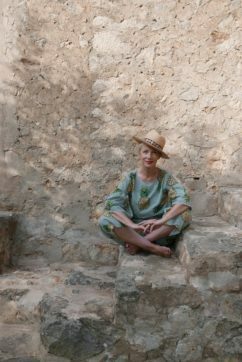 Forging a new way forward takes time and inevitably we have discovered lots of ways of how not to do it along the way! It was a huge challenge, however, Bioglitter® is the culmination of many years of research and development; a family of eco-friendly glitters which now includes the world’s first plastic-free glitter range, certified naturally degradable and non-toxic to the environment. In 2016 we officially launched Bioglitter® SPARKLE to the global market, the world’s first glitter proven to degrade naturally in the environment, containing only 8% plastic. The product received rave reviews and still does, it’s first award being in-cosmetics global 2017 Gold for Innovation and the latest award PCHI Fountain Awards China 2019 winner in the Green and Sustainability category. 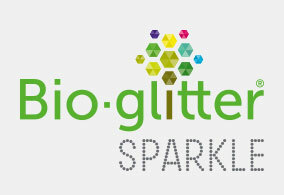 The core of Bioglitter® SPARKLE is a special high tech form of naturally biodegradable cellulose, unique and exclusive to Bioglitter®. This core in its own right possesses excellent eco-credentials; certified compostable in both industrial (EN13432, EN14995, ASTM D6400, ISO 17088) and home composting environments (OK Compost Home) and also marine biodegradation approved to ASTM D6691-09. However, talking about the biodegradability virtues of the glitter core does not confirm the biodegradability performance of the actual finished glitter. Through independent testing to ISO14851 – Fresh Water Biodegradability, we proved that Bioglitter® SPARKLE biodegrades very well in the very challenging natural environment of rivers and lakes. The test showed that in just 4 weeks, the majority of the product had degraded away. This result proves the technical principles of our base technology and manufacturing methods work and the core within the glitter biodegrades unhindered after when we have converted to our finished Bioglitter® product. With this confirmation, we had a solid foundation on which to continue to develop and achieve our goal of a 100% plastic free and OK Biodegradable WATER certification. Bioglitter® SPARKLE was a huge step forward, and it provided us with a solid foundation on which to build our product technology to produce the world’s first plastic-free glitter and certified biodegradable glitter; Cosmetic Bioglitter® PURE. We launched the prototype version of Cosmetic Bioglitter® PURE at the largest cosmetic raw materials industry show in 2018 and again received international acclaim, picking up the in-cosmetics global 2018 Gold for Innovation. Since winning this award we have made improvements to maximise its appeal, picking up another award at PHCI China 2019 and obtained ‘OK Biodegradable WATER’ Certification from TÜV. Cosmetic Bioglitter® PURE uses the same cellulose core as Bioglitter® SPARKLE, but we’ve combined that with our new patent-pending natural coating, enabling us to remove the final traces of plastic. …So the best of both worlds; Not a microplastic and Leave no mess. Not only that! Cosmetic Bioglitter® PURE does NOT use aluminium to give it shine and therefore offers a completely NEW ‘Soft Focus Iridescent’ glitter effect which has not been seen before the in glitter industry. The new challenge we’ve set ourselves is to remove the final bit of plastic from Bioglitter® SPARKLE and retain the high reflective element of the range. We are also hard at work to utilise our proven Bioglitter® technology to expand our range of Bioglitter® effects; Holo, Iridescent and possibly more. Creating A Guilt Free Glitter World! If you have a question, some feedback or just want to get in touch with us, then please use the contact form below and leave us a note - we'd really love to hear from you! Cosmetic Bioglitter®; setting new standards in eco-friendly cosmetic glitter effects. Although a cosmetic grade, Cosmetic Bioglitter® PURE is robust enough for use in non-cosmetic applications. It offers a 100% plastic free and certified biodegradable glitter alternative, for where anything less is not an option! Craft Bioglitter® is a new innovation in kindergarten and primary education level children’s glitter. A new glitter produced from materials that addresses the environmental micro plastic issues associated with polyester glitter.